This weekend the University of British Columbia hosted an alumni weekend and one of the events (the only one I attended!) was a panel discussion titled – Should fighting be banned from hockey? I went with my hockey blogger hat on and was very pleased with the discussion that took place. I must commend UBC Alumni Affairs for hosting a very balanced discussion on such a controversial topic. Doug Clement – Professor Emeritus, UBC Faculty of Medicine, former physician to the Vancouver Canucks (1992-1999), and former Olympic and Commonwealth athlete and coach. Nazin Virji-Babul – physical therapist and neuroscientist, Assistant Professor in UBC’s Department of Physical Therapy and a Scientist at the Child and Family Research Institute. She is currently investigating the impact of concussion on the structure and function of the brain in youth ice hockey players. Michael Gaetz – involved in the development of new procedures for the assessment and rehabilitation of concussions in athletes. He has 30 years experience playing competitive hockey and has been a Hockey Canada certified coach for over 20 years. Ken Cavalier – A former collegiate football and rugby player, Cavalier received his PhD from Northwestern University and a law degree from UBC. He teaches courses on Sports Law, Media and Entertainment Law and Law of the Olympics. The moderator for the session was Rick Cluff from CBC Radio One’s The Early Edition. A podcast of the entire session is posted online, please click the link at the bottom to listen, but if you would like the synopsis of the arguments and discussion that took place please read on. Ken Cavalier – believes that fighting should be retained in hockey for fear of the unintended consequences that might take the place of fighting. He argues that without fighting other forms of violence would be encouraged (he did not really clarify what these forms might be). Cavalier was quick to interject “The Code” saying that there are rules of etiquette to fighting which makes it controlled violence and pointed to the Brashear and Moore incidents as independent of hockey fighting because they weren’t actually fights. He believes that more energy should be directed towards curbing head shots and concussive injuries rather than fighting. Michael Gaetz – doesn’t believe that hockey fighting is the issue if we are trying to minimize concussions. He explained that fighting only accounts for 10% of hockey head injuries and that falling into the boards and elbows are the culprits for the majority of concussions. Nazin Virji-Babul – argued against fighting because (1) youth look to professionals as the gold standard of the sport and (2), in her opinion, all hockey aggression stems from the “acceptance” of fighting. Ryan Walter – explained his argument as an “evolving opinion”. He was very adamant that what we see in the NHL is no longer a game, it is entertainment and every player understands the consequences of his employment, but he also said that he is not proud of the hockey fights that he took part in. He told the audience about how his own son received a punch during a junior hockey fight and 3 years later is not the same young man because of the concussion he received. 1.) Are we trying to eliminate fighting or are we trying to eliminate head trauma injuries? I think this is actually a pertinent question that isn’t posed enough. Are we disgusted with the barbarism of hockey fights or are we concerned about Crosby’s head? Which is worse for children to watch on television, a bloody fight or an unconscious player on the ice? The moderator opened the discussion by saying that perhaps Crosby’s greatest contribution to the game will not be any of his career successes but his medical record because his concussions have brought head traumas to the forefront of hockey conversations. I think the Crobsy, Kariya and Sedin injuries are all examples of terrible concussions that have nothing to do with hockey fighting. Now if we take Virji-Babul’s argument that fighting is the foundation upon which other malicious hits are spawned then maybe we are talking about the same animal. If we think about head shots, hits from behind and flying elbows as a form of intimidation then maybe they serve the same purpose as fighting. Maybe elbowing should now warrant an ejection from the game? Will that make the game safer? 2.) Doug Clement argued that the players aren’t responsible for any of the malicious hits, rather the referees are at fault. He contended that if referees were able to see the ice better and stuck to enforcing the rules rather than “letting them play” it would be a safer game. He also thinks that incorporating video-replays and more refs on the sidelines watching those videos (footballesque, I suppose) would make players more accountable for their actions. Clement then argued that there is less fighting in international hockey because the ice is bigger (promoting a skating game), there is better rule enforcement by the referees and because the culture is different. The rebuttal from Gaetz was that despite the fact that there is no fighting allowed in the Swedish Elite League their rates of concussion are similar to those of the NHL, hovering around 12-13%. Thus, this brings us back to point #1 – are we trying to eliminate fighting or make hockey safer? They seem like the same argument but the statistics add an interesting dynamic to the discussion. 3.) Ryan Walter spoke about parents putting too much emphasis on their children making the pros. In Canada, we have over 500,000 children participating in ice hockey and less than 1% of those children will make the NHL, but every parent believes that their kid is in that 1%. He said that he has found young players texting the “goon” on the opposing team before games to set up a fight during the second shift of the third period. Walters argues that the funnel of Canadian hockey starts very broad but closes very quickly and arguably, the pressure put on children by their parents makes them think that fighting is a viable route to get to the pros. Walter came back to the point of parents and coaches repeatedly, which I thought was very intruiging. He argued that the professionals do not have nearly as much emphasis on children watching than do their own coaches; and, said that there has been “an abdication of leadership at the lower levels” with too much emphasis placed on the NHL. The NHL, in his opinion, is not going to change its tune because it is driven by revenues but each minor hockey coach has the ability to influence twenty kids. Thus, he thinks that more resources should be put into proper coaching because, as we all know in North America, its Billy’s dad or Annie’s mom who is coaching the local team. But is Billy’s dad or Annie’s mom properly equipped with the knowledge and values to coach our children? Walter argued that in Europe coaches must have coaching certifications, and much more intensive certifications than the 2-hour sessions provided by provincial hockey associations in Canada. 4.) Virji-Babul asked – what would happen if fans didn’t cheer for hockey fights? I thought this was a provocative thought, kind of like – if a tree falls in the forest and there’s no one there to hear it does it make a noise? It would be interesting if two heavy weights circled up ready to fight and the stadium went silent, or people started leaving. The reply from Walter was that as a player he doesn’t remember anyone from the stands. As high performance athletes they are trained to focus on the task at hand and nothing else. Nonetheless, I would counter that we have seen enough players come out of a fight egging on the crowd and waving their finger in the air that clearly they do notice the audience from time to time. 5.) Doug Clement asked – has there ever been an enforcer who wasn’t from North America? The moderator argued that Chara could be considered an enforcer but I’m not sure how intimidating he would be if he were 6″0. It has become quite apparent that vigilante/frontier justice is very much aligned with Canadian (North American) ideals of masculinity but hockey is now a global game so should we account for multiple interpretations of masculinity or do we keep fighting because it has origins in the game? Do you hold on to tradition or progress with the times? 6.) A comment from the audience came from a dad who coaches minor hockey in London, Ontario. His team was being used as research subjects for a concussion study and once the OHL (Ontario Hockey League) caught wind of unfavourable results the OHL banned the research team from continuing their research. Makes me wonder how often these types of things happen. Obviously the fear is that if hockey data proves that it is extremely dangerous rates of participation will decrease but why are we not jumping on the chance to make the greatest game on earth, in my opinion, safer so that more people can enjoy it? In conclusion, I think Walter’s point of increasing responsibility onto parents and junior coaches is an important one. So often we chastise our athletes for being poor role models but there is very little research proving that role models as distant as those we watch on television have any impact on our individual behaviours. What does have an impact on our behaviours are mentors – people with whom we have regular contact. I think what many of us want is for the game to remain fast and hard hitting but to minimize the risks as best we can. I would argue that after this panel discussion that the larger concern is more surrounding head trauma than fighting. What I did not hear anyone talk about was the emotional and mental toll fighting takes on enforcers. This, I think, might be a stronger argument against the elimination of fighting. I suppose we could argue that the emotional toll that Rypien and Boogaard underwent was connected to the head traumas they received from fighting but I think the anticipation and fear of fighting can just be as debilitating. I should also mention that former Canuck enforcer, Gino Odjick, was in attendance at the discussion. He still has his fighting form but no one really made a fuss about him being there. During the question period he raised his hand to try and get a microphone. They didn’t have time for his question and I don’t think the volunteers really knew who they had in the audience, which was unfortunate because I, for one, really wanted to know what Gino had to say about the subject at hand. To listen to the entire podcast please click here. – Regarding eliminating fighting vs. headshots, I really do think we need to (partially) disentangle the two. Of course, eliminating 10% of concussions would be great. But I think that the social damage of fighting, which you allude to, is far more significant than the concussions and that therefore it’s best if anti-fighting advocates avoid the concussion argument (also because it comes off as sounding somewhat naive or uninformed to pro-fighting advocates who understand the sport and that fighting does not cause most concussions). I wrote a post way back along these lines – basically saying that anti-fighting advocates need to do better than wringing their hands and talking about concussions, and really work to explain in an accessible way why fighting happens and the social consequences of it. So far, most of us (myself included) are doing a pretty crap job at that. – Clement’s point that the refs are to blame for dangerous play is pretty BS in my mind. It is no secret that refs constantly adjust their calls to the mandates set out by the NHL. If the league suddenly thinks there’s too much hooking, you’ll see a lot more hooking calls. Ditto for diving, goalie interference, etc. The refs certainly have the ability to set the tone of an individual game through their calls and game management, but let’s not let the NHL off the hook here. They are the puppetmasters in this situation, and I don’t think it’s fair to blame the refs for the very fine line that exists between accepted “clean” play and illegitimate “dirty” play. – Finally, regarding the remark that inspired the title of your post. I’ve often wondered what would happen if public reaction to fighting became so negative that fans actually booed when fights broke out. How would that make enforcers feel? Would the NHL react to its fanbase or would the league kick into “total institution” mode and defend fighting? For sure people like Brian Burke, John Tortorella, etc. would do the latter. But I wonder how long before the league took steps to reduce or eliminate fighting? Well basically the panel agreed that the NHL would listen to 2 things – empty seats and litigation. Empty seats, realistically, won’t happen to a large enough extent to make them change their tune. Or at least not as quickly as we would want it to. Litigation – definitely possible. The example they brought us was the NFL class-action, saying that maybe some recently retired players need to get together and put their foot down. But again, I think if anything, player would get together to combat head shots and predatory hits but NOT fighting. 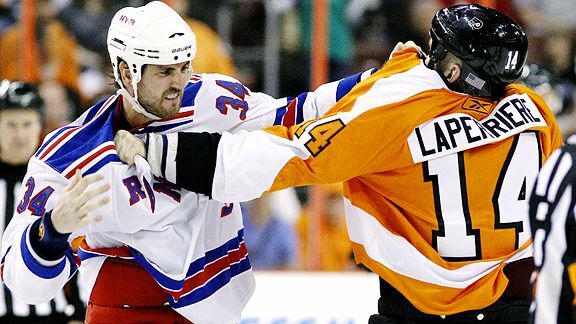 On my blog I have posted many reasons why fighting should be eliminated from hockey. Although I have addressed the concussion issue the majority of my posts have been focused on dispelling the myths of momentum and policing, and trying to understand why it remains an element of hockey’s culture. I’m against fighting because it ruins the game and damages the image of the sport. Hockey is about fast paced action, hard-clean hits and the skill of the players. But the injury issue alone is enough for the NHL and junior hockey leagues in Canada to take action. Why are we defending an activity that is already against the rules AND contributes to the concussion issue. We agonize over every flying elbow but think nothing of two players punching each other in the face. Fighting may be responsible for a small percentage of concussions but, as reported by The Sporting News, if is likely more dangerous than most believe. If you combine fights and hockey hits, fights make up less than 1% of the contact between players, meaning you are 3 or 4 times more likely to suffer head trauma by dropping the gloves. Great job. Thank you. Should fighting be banned from hockey? The title of the panel discussion seemed too narrow a question. However, that question spawned others. And these generated more dialogue. Healthy discussion is the key in this debate. I especially commend Ryan Walter for declaring his evolutionary stance on the topic. Injuries, societal impact, training considerations, international and cultural considerations: these topics have fuzzy boundaries, so staying on one side of the fence is a difficult endeavor. If fans who feel fighting detracts more than it adds–how many really miss the fisticuffs in the NHL playoffs, in the college hockey, Olympic Games?–speak up in forums like this and remain silent in their seats during an NHL fight, then the players, coaches, GMs, and NHL management will notice. Will they do anything to institute change? Perhaps more drastic measures are in order. Fans who don’t need or want the fighting may have to cease attending games whose league both promotes and punishes fighting. If watching from home, leave the room when fighting is staged or erupts. Read a book during the commercials.